The Belfast Bicycle Network Plan consultation period is near the end and it is time to understand what it can provide for cycling. It is a plan that builds on the Bicycle Strategy, launched by the Department in August 2015, with the intention to create a comprehensive network for safer cycling that would lead towards a better cycling modal share. While the plan has many flaws and inconsistencies, this article intends to dwell on its merits. Cycling modal shares have stayed statistically low for the past decades. Even if you see more bicycle users on the road lately (also thanks to the success of Belfast Bikes), the latest reports from the government show that cycle modal share is around 1%. With all the benefits that a greater cycling modal share brings to any city, it is good to start to see action plans to vastly improve the city’s infrastructure for bicycles some at the expense of private motor traffic – like Middlepath St or the High St consultation. NI Cycles hopes this trend continues and that with each new project better conditions are provided to people who choose to cycle (and walk). 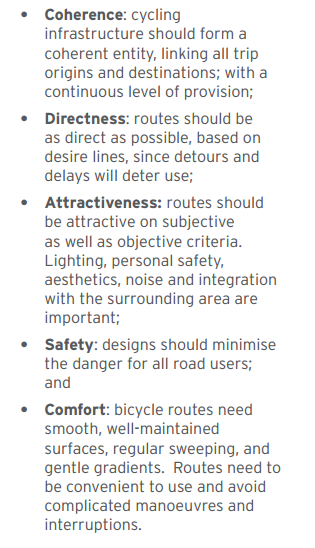 The main criteria to support the design, above, are derived from the London Cycling Design Standards (chapter 1, pages 3 & 4). This is good to recognise the necessities of people cycling and build a network that promotes the use of bicycle by itself. Unfortunately, this is not fully backed up by the remaining proposal presented. It also lacks any acknowledgement with other modes of transport. However, this two issues will be addressed in a subsequent article. Nonetheless, the understanding of people cycling needs is acknowledged and it is just a matter of enforcing them in the next and revised plans. The plan has a direct route from Cairnshill Park & Ride. Though the route goes through a steep hill (something to be reviewed), it is something that might get some uptake. 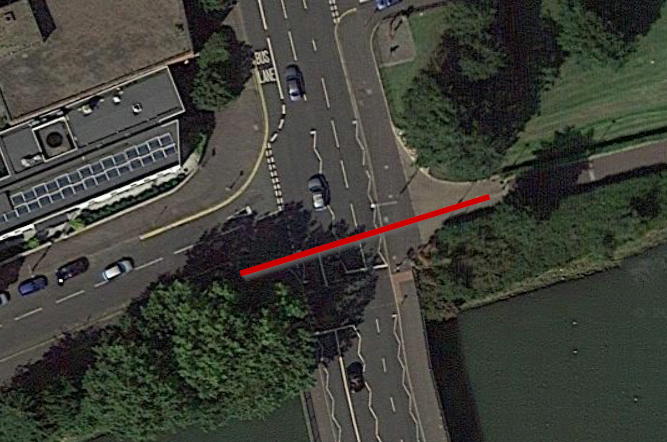 The route proposed is just over 5 miles, right on the limit of “acceptable” distance for a regular cycle commute. Additional Park & Ride facilities that could benefit are the Black’s Road and Dundonald. Both are under the 5-mile mark and have the potential to increase the number of people to choose bicycle towards the city centre. The plan also includes a few new bicycle underpasses to keep the route more direct, safe and avoid unnecessary handling of busy intersections. 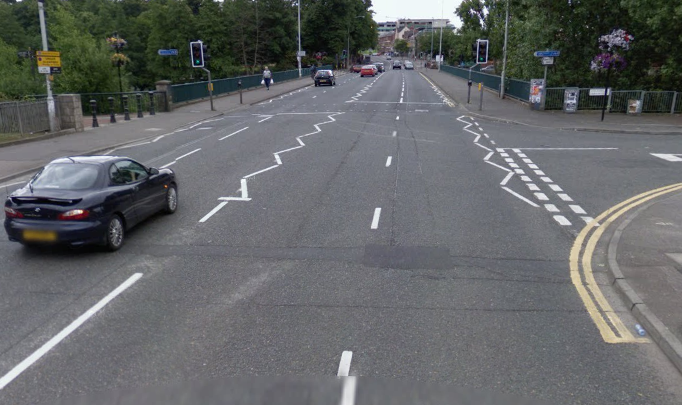 Two of the proposed underpasses are at Ormeau bridge junction (connecting the Lagan towpath) and the King’s Bridge junction. These roads are extremely busy, especially at commuting times, and span multiple road lanes. The plan has some good ideas that must be built upon. 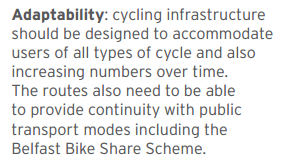 The plan, as it is, is likely to increase the cycling modal share. Unfortunately, it does not go far enough to reach the city’s potential and to increase massively the attractiveness of cycling. The next article will focus on what NI Cycles objects to and what needs to be heavily reviewed in order for the new and improved cycling provision to have a meaningful impact on how people travel to, from and within Belfast.